Albert (a ghost) is unaware of his own state of mortality, that is, until Mya (a lively young teenager) comes along to ruin his day with the news. Together they crave for answers as to how Albert had died and why his life was cut so short. The problem? The Mansion in which Albert had once occupied, which should hold key to the answers he desperately craves, is due to be renovated. Albert and Mya must work together to get the workers out of the mansion any way possible. It’s been awhile! So what’s new? New story content, new gameplay features and more. This article will focus on giving Haunted Emotions more personality, including new investigation gameplay and better AI personalities. 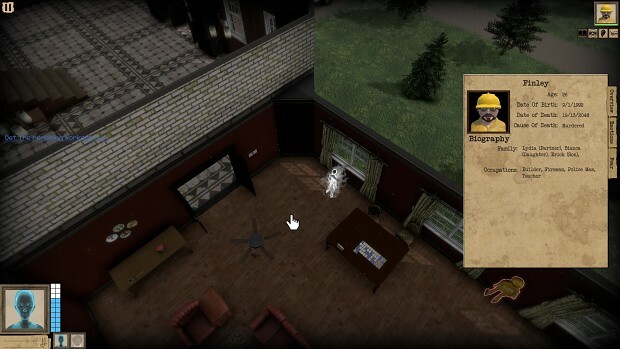 At the moment it is in its early stages, but eventually you’ll be able to rotate objects to look for specific clues. I also need to add a piecing together section where you can link clues together to correctly reform a memory. In this example, it was just one clue so a simple cutscene is all that is needed. In a previous article (Update 4) I discussed personality traits (fears and guards), which are basically the worker’s weaknesses (Fears) and strengths (Guards). Since then I have added quite a few more traits. In the example in the video below you can see the worker has an ignore trait (strength), which means they are unaffected by anything the player does. To combat this the player must target their fears (weaknesses) which breaks their ignore trait. To help the player figure out how to scare the workers, they are given Soul Files, which help to paint a picture for each worker. The overview page (as seen below) gives the player a bit of information about them. The fear page not only shows the worker's current fear level, but also their personality traits, as discussed above. The player can hover over each trait, which gives them more information about said trait.